Former Labour leader Lord Kinnock has said he is "delighted" at his wife Glenys's surprise appointment as Europe Minister by Gordon Brown. Glenys Kinnock, who has just retired as an MEP after 15 years, is to be elevated to the House of Lords to enable her to take on the role. Lord Kinnock, himself a former EU Commissioner, said his wife would be a "wonderful asset" to the government. The Tories attacked the move, saying it would not improve scrutiny of the EU. 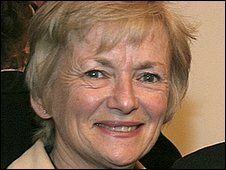 Glenys Kinnock has replaced Caroline Flint, who resigned from the cabinet on Friday as part of a wide-ranging reshuffle carried out by Gordon Brown. Lord Kinnock said the appointment was "wonderful". "She will be such an asset. She is committed, knowledgeable, and she's got bags of energy," he said. "They couldn't have possibly picked anybody better." But the move was not warmly welcomed by opposition parties, who said the government's European policy was characterised by drift. "We all hoped we had got rid of the Kinnocks in Brussels," said Timothy Kirkhope, leader of the Tories in the European Parliament. "This is the 11th Europe minister in 12 years. At a time when the EU has to face up to serious challenges on the economy, the environment and jobs, the government needs clear, consistent leadership". The United Kingdom Independence Party (UKIP) said the appointment was "totally inappropriate" given the couple's long association with Brussels.